After 3 years in development, the latest project from Jeroen Ooms is now ready. OpenCPU is a software framework for embedded statistical computation and reproducible research. 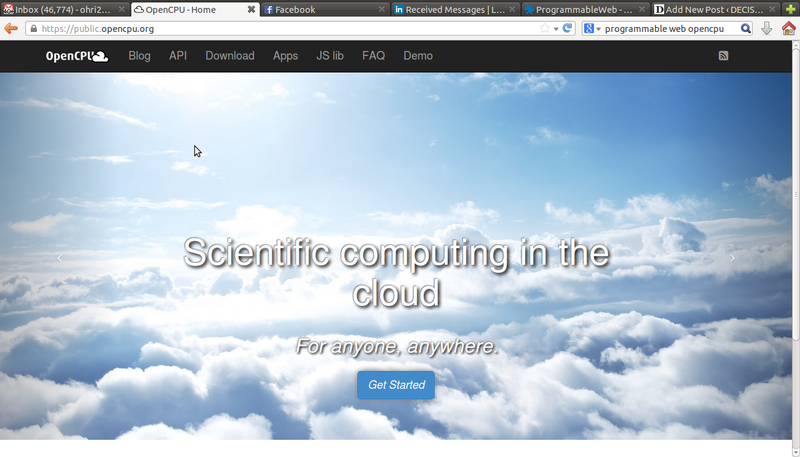 The server exposes a web API interfacing R, Latex and Pandoc. This API is used for example to integrate statistical functionality into systems, share and execute scripts or reports on centralized servers, and build R based “apps”. The OpenCPU server can run either as a single-user server inside the interactive R session (for local use and development), or as a cloud server that builds on Linux and rApache. An OpenCPU app is an R package which includes some web page(s) that call the R functions in the package using the OpenCPU API. This makes a convenient way to develop, package and ship standalone R web applications. Security is enforced using AppArmor. AppArmor is a security module for the linux kernel and enforces mandatory access control policies on a by-process basis. These policies can easily be customized by modifying the AppArmor profiles that ship with the OpenCPU cloud server. Both the OpenCPU single-user server and OpenCPU cloud server have been tested to work with RStudio 0.98 and above. See also the appendix in the server manual on this topic. Can OpenCPU be used to build proprietary applications? Absolutely. OpenCPU is released under the Apache2 License.